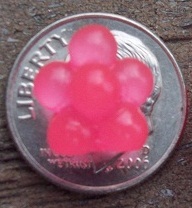 Egg Clusters / Artificial Roe Bait for Salmon, Steelhead and Trout! Proudly designed, tested and manufactured in the USA. The Mini Salmon Egg Clusters come with 20 egg clusters per pack. This is an Artificial Roe bait that is LOADED with REAL Shrimp & Roe scent and other natural ingredients that we have kept a secret (we can't give away all of our tricks). Not only do we package these baits with scent, they are also infused with scent during the manufacturing process. This double scenting truly sets our baits apart from the competition and gives our customers a serious advantage. What is a Guide Pack? These baits are hand made in our own facility in Grants Pass, OR. We don't buy from some other source, we make them in house and all raw materials are 100% Made in the USA. Every detail of these baits has been carefully thought out. From size, to color to scent these baits are tailor made for Salmon, Steelhead and Trout fisherman. Our scent infusing process truly sets these baits apart from any other artificial bait on the market giving you an effective, easy to use, mess free and readily available alternative to natural roe. These baits rock! If you are looking for a small cluster of eggs about the size of a dime well here you go. These baits are the perfect size for lower water salmon and steelhead. Or maybe a time when you want to down size a presentation. Steelhead in particular love these egg clusters. I experienced a true testament to these baits last April while fishing the Cowlitz River. Fishing had been slow from what we were hearing but I was determined to find some fish. I proceeded to hook 7 fish on the first day only landing one due to the fast water. My friends were in disbelief and soon were jumping to get some of these baits. The next day I hooked 2 and landed both. I hooked 9 fish in 2 days when many went home without a bite. I have had other days as well when I caught a fish or two when the bite “died off” or “there just aren’t many fish around”. These baits are one of my go to baits when drift fishing. I always have a few leaders rigged and ready to go. they're awesome....trout/steelhead go crazy !!! i was very happy with the product very realistic with great scent. 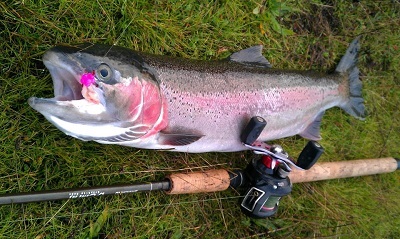 I caught my first river steelhead with the hot red rigged just like they show. Eggs work great, used them on the trinity with my flyrod ! Yes flyrod ! I would definitely recommend this product. Best on the market ! Used in late May 2014, on the Cumberland River near Burkesville, KY. Drifted the hot pink mini egg clusters along the bottom and caught several really nice rainbows. If complete fairness, my friends fishing on another vessel nearly caught as many as I did using rooster-tails and countdowns. Bait will produce fish but not completely sure if it's any better than other means. Nice product, but it is a little bad it is flat on one side. not so natural. XFactor has nailed it when it comes to simulating trout eggs in their mini egg clusters! Paired with synthetic mesh sac netting, this will deliver the natural appearance and is sure to trigger bites on the water this spring here in PA! Great job! Q: Do these artificial eggs float ? If this doesn't address your specific needs, let us know. Q: In winter steelhead fishing what are the best egg colors to have? Is there a main standard color. Typical water clarity where I fish is clear. Not gin clear but not dirty. American river California. Q: What is the go to scent for Trout on the mini egg clusters? The most popular scent for hatchery Trout is Garlic. Others like Anise but you can't go wrong with Shrimp or Shrimp & Roe because they just smell like natural food. Garlic is REALLY strong and works better on hatchery fish, natives seem to have more discernment and respond better to more natural scents. Let us know if you have any other questions. Q: What size bead cluster is better foe stream steel-head , and what colors are usually the best late winter early spring. Thanks, Looking forward to order your product, I fish steel;head in Erie PA. ? I'd recommend these (the mini egg clusters). 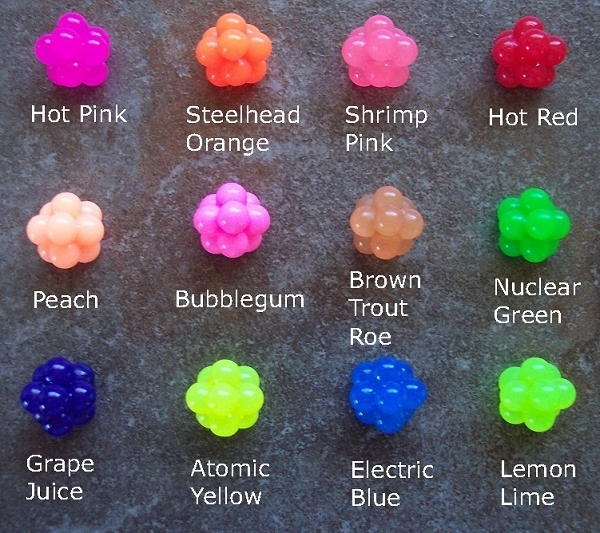 Brown Trout Roe, Steelhead Orange, Atomic Yellow and Shrimp Pink would be on my list...Peach is another good one. Let us know if you have any other questions, were happy to help. Q: I use a size 10 bait-holder hook for minnows, My question is what hook will work best with the mini egg cluster ? and will my size 10 be ok for drift fishing, and bobber fishing ? A: Hi James, if a #10 hook is working for your fishery then by all means, stick with it. Just make sure the baits are above the hook so they don't get in the way of the hook point. Q: how big are your mini salmon clusters ? I was looking at some of your displays and wasn't able to get a good view of the size. I'm especially interested in the brown trout cluster since I live here in erie,pa and the steelhead are very much attracted to smaller egg sacks; containing fresh brown eggs of course. But I have learned that on occasion, these soft egg sacks can do the trick. Thank you in advance. A: Hey Eric, thank you for your interest in our baits! Our mini eggs are smaller than a dime, overall diameter is approx 10mm. Both these eggs and our 8mm single eggs are popular baits for Erie, PA steelheaders.